On Monday, I talked a bit about the AL MVP race and how Chris Sale should pretty clearly be the frontrunner at this point. Over in the National League, though, it’s not really possible to write a completely honest piece advocating for just one single candidate, because as of mid-August, there are nearly 10 guys with legitimate cases for the award. The likely leader in the clubhouse right now is Paul Goldschmidt. The case for him is pretty easy to make: he’s the best player on a team that wouldn’t be in the postseason race without him, and no one is clearly outplaying him. He’s fifth in batting average, third in on-base percentage, and sixth in slugging, and for those who are still into those kinds of things, third in RBIs. He leads the NL in WAR, so he’s not a Juan Gonzalez-type of traditional candidate who gets exposed by looking deeper. The Diamondbacks are pretty likely to make the Wild Card game, so he’ll probably get the playoff-team boost. Overall, he’s got something to offer pretty much every kind of voter and would almost certainly be the favorite to win the award if it were held today. But while Goldschmidt probably would have the most diverse appeal among voters, and would almost certainly finish in the top two or three on the most ballots, he might not be the top choice for as many voters as you’d think. For one, Giancarlo Stanton is going to hit 50 home runs and might end up at 60, so for those who just want the best slugger, there’s a huge gap between Goldschmidt and the NL’s premier home-run hitter. Giancarlo Stanton represents one-tenth of the NL players for whom you could make a reasonable MVP case. For voters who prefer RBI as their go-to offensive metric — and there are still some around — Nolan Arenado is an easy sell, as he leads the league in that category and plays a spectacular third base. His team is also a surprise contender who wouldn’t be one without him, and his batting average and home-run totals are nearly the equal of Goldschmidt’s, so for a voter who wants to stick to how MVPs were picked back in the day, Arenado looks every bit Goldschmidt’s equal on offense and offers more value in the field. But both of those guys are playing for Wild Card teams, and Stanton’s team is out of the race entirely, so if any voters decided to limit their pool for the top spot to players only guaranteed a playoff spot — since the voting has to be turned in before the Wild Card game is played, perhaps such a voter would decide that a Wild Card-losing team didn’t actually make “the playoffs” — they’d still have a cornucopia of deserving candidates from which to pick. Corey Seager and Justin Turner have been two of the main reasons the Dodgers might challenge the all-time record for wins in a season. With Bryce Harper’s injury, Anthony Rendon — who is basically Nolan Arenado but playing at sea level — might appeal to someone who wanted to vote for a Nationals position player. Of course, you could make a case that Max Scherzer has actually been Washington’s best player this year, and if you just go by runs allowed, it’s Scherzer who leads the NL in WAR this year. Waters still not muddy enough for you? Kris Bryant, last year’s winner, hit .292/.385/.554 and got 29 of the 30 first-place votes in 2016. This year, Kris Bryant is hitting .293/.405/.535, and as with Goldschmidt and Arenado, you can make the case that the Cubs wouldn’t make the playoffs without him — unlike last year, that is, when he had plenty of help from his supporting cast. The drivers of his big drop in WAR are fielding and baserunning, which are the variables that voters tend to trust the least. If you voted mostly for Bryant’s bat last year, it doesn’t look that different this year. Biased towards up the middle hitters but not that impressed with Seager’s 19 home runs? Or want to discount him for playing on a team with too many good players? I’d like to introduce you to Charlie Blackmon, a center fielder hitting .333/.392/.611. Even after adjusting for Coors Field, Blackmon’s been a monster at the plate and ranks up near all the other non-Goldschmidt hitters in WAR. Of all the players playing an up-the-middle position this year, Blackmon has been the best hitter, so anyone who simply wants to adjust for defense and find a guy who hits like a first baseman while playing a premium spot, Blackmon is an appealing option. And somehow, after naming nine legitimate candidates for the MVP award, we still haven’t talked about the league’s best hitter yet. That would be Joey Votto. Again. Votto is tied with Turner for the league lead with a 166 wRC+, but he’s done it in 135 more plate appearances. Anything you like about Goldschmidt’s bat, Votto can match: his .316/.448/.600 line is a little better than Goldy’s .320/.434/.600 line, and given Votto’s current run and his recent history of second-half ridiculousness, it wouldn’t be surprising if he opened that gap up a bit more by season’s end. That’s 10 names with which you could easily fill a ballot, and really, all of them have at least some kind of argument for the top spot. Some arguments are stronger than others, but still, this is a remarkably crowded field. The list will undoubtedly narrow itself further — Harper and Clayton Kershaw already fell out of contention due to injuries, or else this would be even more ridiculous — as we get closer to when the votes are due, but I don’t envy voters who got handed an NL MVP ballot this year. My NL Rookie of the Year pick is going to be quite a bit easier. 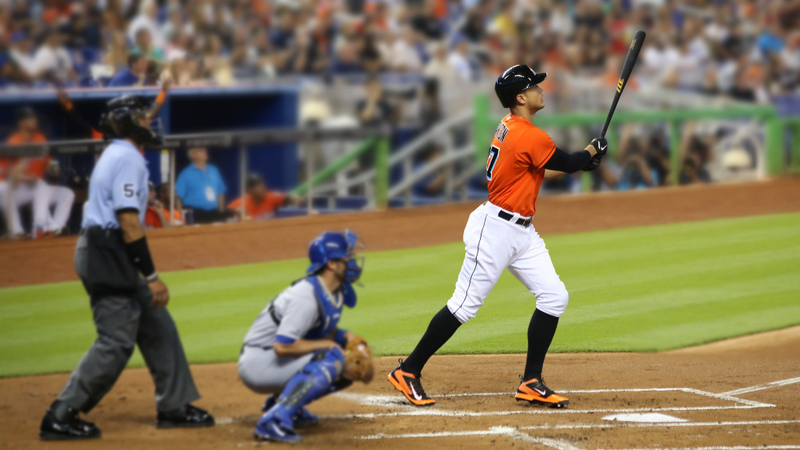 We hoped you liked reading The Fascinating Race for the NL MVP by Dave Cameron! What IS up with Votto’s 1st/2nd half splits? I wanted to say it’s a crime against humanity that he didn’t make the All-Star team each of the past two years, but then you look at his 1st-half numbers and it’s suddenly not that absurd. Every winter NL pitchers spend furious energy figuring out new ways to get him out. Every Spring it works, a bit, for a little while. But the more Votto sees of them, the less they are able to fool him. If the season was 500 games long you might see him OBPing 1.000 by the end. If memory serves he ran like a sub .200 BABIP in April. I’ve had this theory on Votto for a few years now. I think he is intentionally manipulating his heat map and scouting report in the first half, which allows him to really benefit in the second half. Hitting a few weak grounders in his hot zones, swinging at pitches in areas he doesn’t normally swing at, all those things to fool pitchers into thinking he has weaknesses that aren’t actually there. He’s Canadian. He’s distracted until June by the Stanley Cup. As a reds fan, I think, like myself, he’s bored by the all-star break as the Reds are now out of contention. By a lot. So he decides to entertain himself by playing at a ridiculous level. Always include the previous year’s 2nd half stats in ASG voting. 2016’s trash(no credit for good 2nd half) is 2017’s treasure(hate voting on SSS).